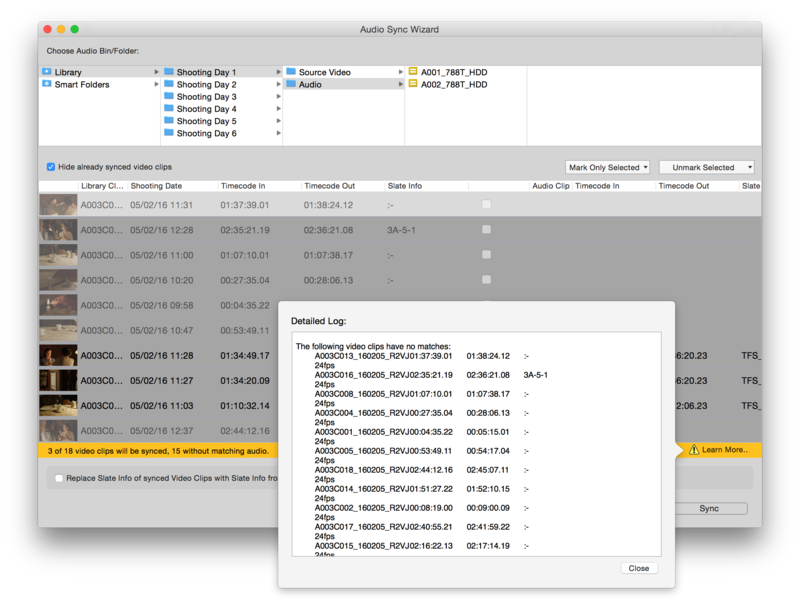 Silverstack Lab comes with functionality to automatically sync Broadcast Wave (BWF) audio files to their corresponding video clips via timecode. Please refer to the article Parallel Offloading to learn how to offload media in Silverstack. Alternatively you can read Adding Clips to the Library (Ingest without Copy) if you only want to register footage and audio. Please refer to the article Audio Clips in Silverstack to learn more about the handling of audio in Silverstack. 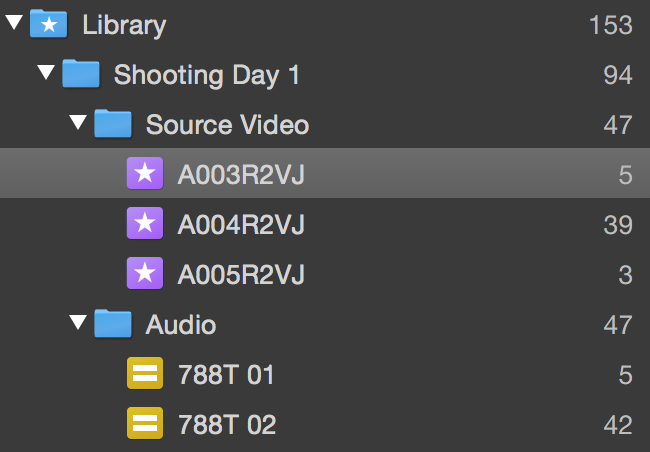 Select the video bin or folder you want to sync audio clips to. Alternatively you can access the audio sync wizard from the “Media” button in the toolbar or the context menu of a bin or a selection of bins. The enablement of the checkbox “Hide already synced video clips” will exclude all video clips from the display in the list view that already have external audio. If the checkbox is disabled the video clips that already have external audio attached will be shown in red letters. The checkbox “Replace Slate Info of synced Video Clips with Slate Info from Audio Clips” will take over the slate info from the metadata of the audio clips to the video clips. That includes scene, shot and take information. After completing the process go ahead and click “Sync” to execute the audio sync as displayed in the wizard. You will be able to check the sync by playing back the video clip in the player. Reveal Audio Details: The audio details panel for external track allows to zoom into the waveform for a visual sync check. Slip Audio: Slip external audio tracks to adapt for audio/video offsets. Re-Sync Audio: Re-sync single audio clips or all audio clips in a bin again. Transfer “Audio TC offsets”: Transfer Audio TC Offsets to other timecode-synced audio clips. The “Audio TC offsets” describe the offset of an external audio clip to its TC synced position. 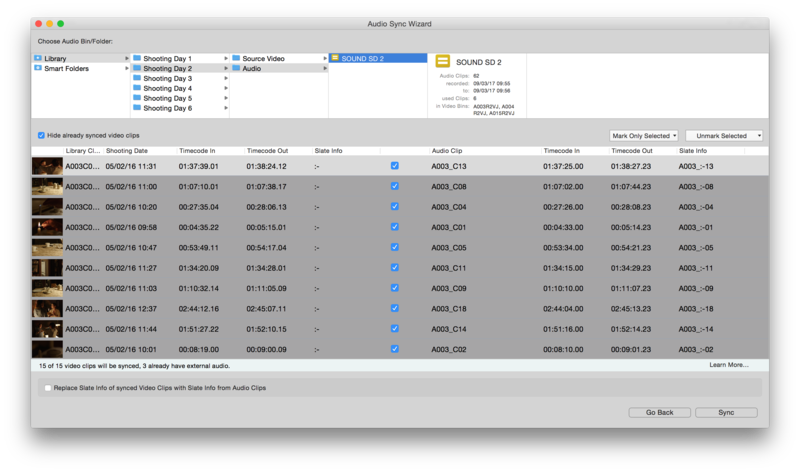 Lock Audio Tracks: Lock single audio clips to save them from being altered. Transfer Mix Settings: Apply a mix to all audio clips in a bin. 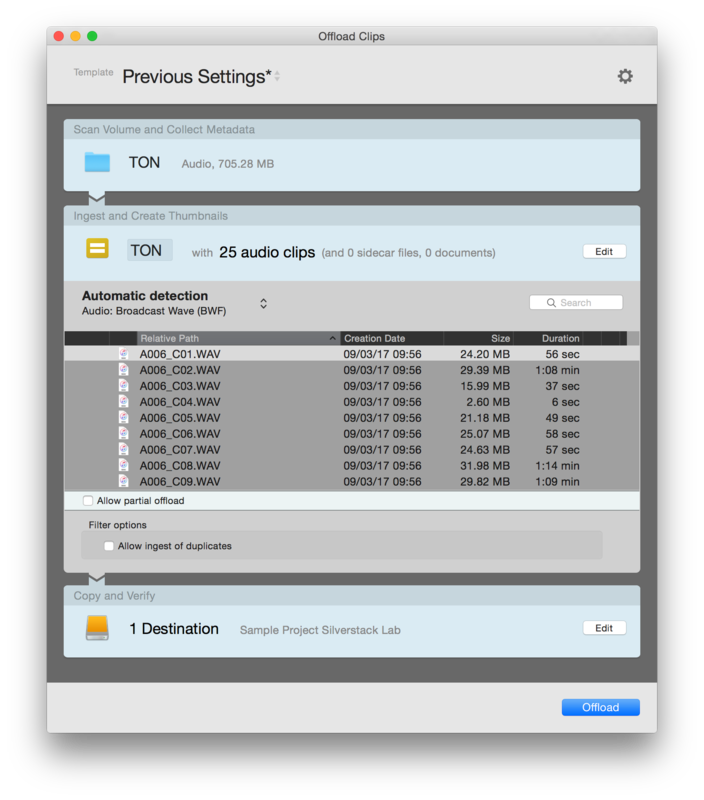 Remove External Tracks: remove single external audio clips or all external audio clips in a bin or selection. You can open the audio details with the “Audio Details” button in the toolbar of the audio panel. Slip buttons: The slip buttons allow to slip audio to the left or right relative to the video to compensate for audio offsets. Frame selection for audio slip: You can select the amount of frames to slip from the dropdown. It will affect the slip quantity when pressing the slip buttons. 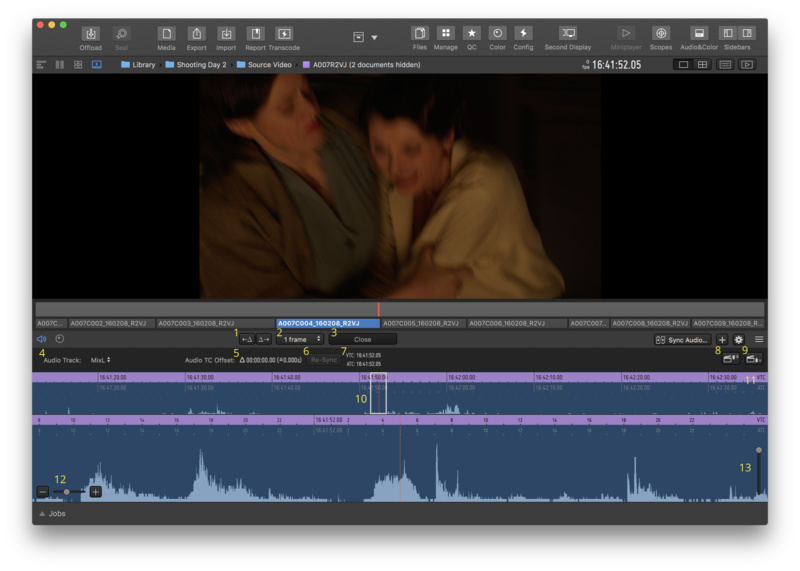 Audio TC Offset: Specified the offset between the identical audio and video timecode. The offset is displayed in TC and its equivalent in seconds. Re-Sync: Click the re-sync button to re-sync audio and video by timecode. By its nature this resets the Audio TC Offset. VTC and ATC: Shows the current Video TC (VTC) and Audio TC (ATC) at the current frame position. Set Audio Slate Marker: Sets an audio slate marker at the current playhead position to manually sync audio and video based on slate positions. Set Video Slate Marker: Sets a video slate marker at the current playhead position to manually sync audio and video based on slate positions. Detail Area and Playhead: The white rectangle shows the zoomed waveform below covers. Timeline Rulers Video & Audio: The video TC ruler shows in pink and the audio TC ruler shows in blue below. Zoom In and Out Buttons: You can zoom in and out of the waveform with the + and – buttons . Amplify Slider: With the slider on the right you can amplify the height of the waveform. You can drag the playhead around with the mouse to change the inspected area. 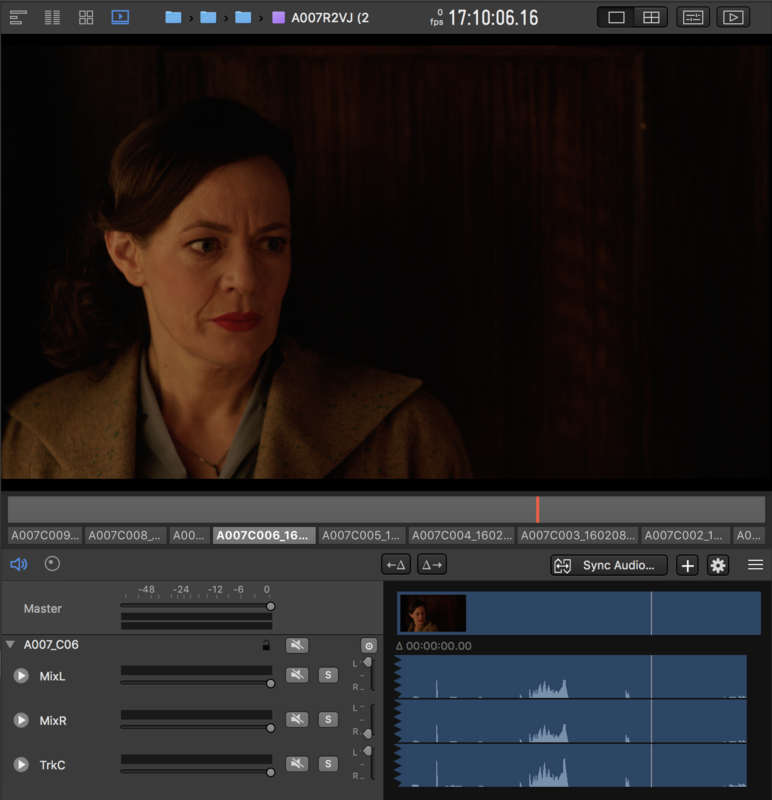 External audio clips that have been synced via TC can easily be slipped frame-wise to each side to alter their position relatively to the video clip. The slipping position is stored in timecode format in the “Audio TC Offsets” field, viewable in the General Info, and describes the offset of the audio clip from its sync position (sync position: where the audio timecode equals the video timecode). Indication I in fig. 9 shows the buttons that can be used to slip the audio one frame to the left or right proportional to the video track. This will basically alter the “Audio TC Offset” (see V in fig. 9) for the external audio clip. The “Audio TC Offsets” are also available in the “Edit” section of the General Info and can be exported to reports and as metadata for source video clips and transcoded clips. To apply an Audio TC Offset to other clips go to the gear menu on the right of the audio header bar (see II in fig. 9) and from the menu (see fig. 10) select “Apply Offset to All Timecode-Synced Clips (Entire Bin)” to apply the offset to all clips in the bin or select “Apply Offset to All Timecode-Synced Clips (Selected Clips)” to apply it to a selection of clips. 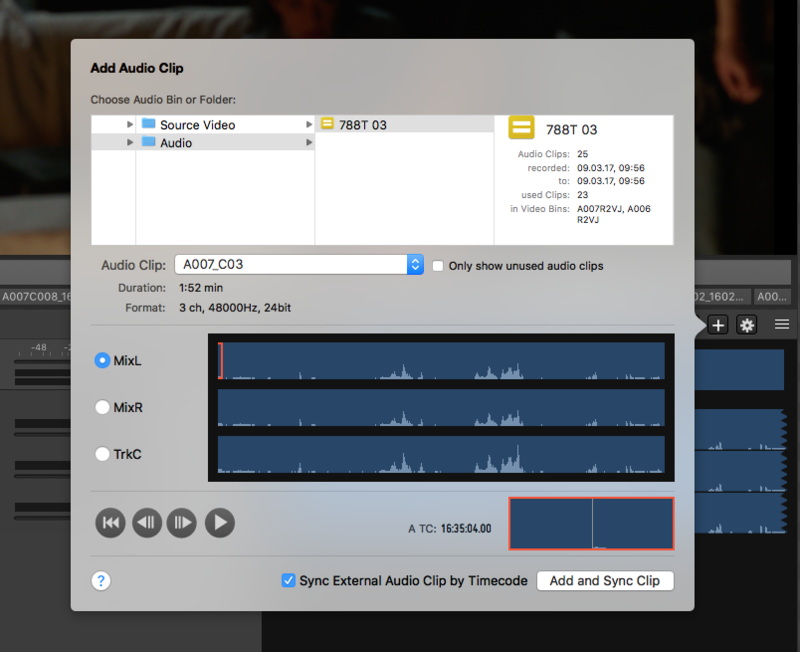 Timecode-synced external audio clips can easily be re-synced again by selecting “Re-Sync Audio (Entire Bin)” or “Re-Sync Audio (Selected Clips)” from the gear menu opening from the button indicated in II in fig. 9 and shown in fig. 10. This functionality will basically reset the Audio TC Offset that has been applied with the slipping procedure described above. 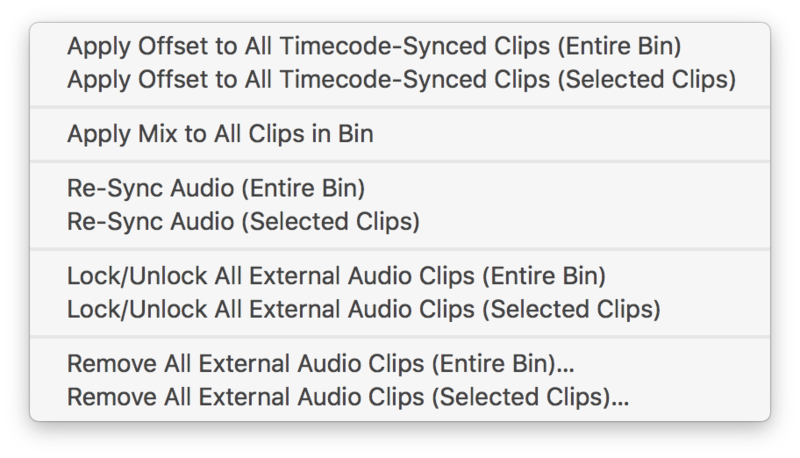 You can lock and unlock external audio clips of a selection of clips or for all clips in a bin by selecting “Lock/Unlock All External Audio Clips (Entire Bin)” or “Lock/Unlock All External Audio Clips (Selected Clips)” in the gear menu (see fig. 10). The transmission of the settings bases on the audio track names. That means that the audio settings will be taken over to channels with the same name in other audio clips. You can remove external audio clips from an entire bin of video clips or from selected video clips by selecting the entries “Remove All External Audio Clips (Entire Bin)” or “Remove All External Audio Clips (Selected Clips)” (see fig.10). Single external audio clips can be removed by clicking on the gear menu in the header bar of the external audio clip (see IV in fig. 9 and fig. 11). Reveal: Reveals the audio clip in its audio bin. Mid/Side: Select the channels that should be used for mid/side stereophony. Silverstack Lab generally differs between a sync by TC and a manual sync via slate positions. While you can slip both types of external audio with the slip buttons (see I, fig.9) some functionality is not available for manually synced clips like e.g. applying a Audio TC Offset of a manually synced audio clip to other audio clips. 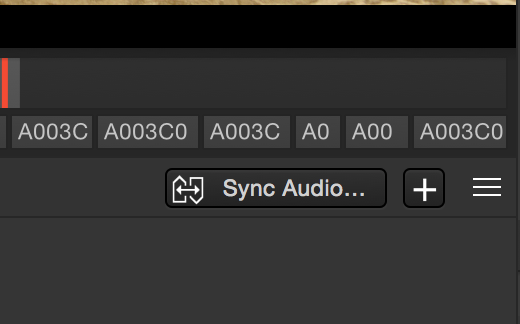 When an external audio clip has been synced via timecode you can easily transition to a manual sync via slate markers that can be set in the audio track popover. To return to an automatic sync just re-sync the audio clip as described above (see fig. 10 or fig. 11). Learn more about manual audio sync in the article How to Manually Sync Audio in Silverstack XT and Silverstack Lab and more about Audio Clips in Silverstack here. You can either choose to sync the audio clip based on TC or leave the checkbox empty to sync based on slate positions in the audio and video clip.